WW1 Reenactments Equipment : Great War Tommy WW1 Documents, Paperwork : Soldier/Sailor, leave/duty , Ration Booklet. WW1 Reproductions and WW1 Reenactors Equipment / Kit - Soldier/Sailor, leave/duty , Ration Booklet. 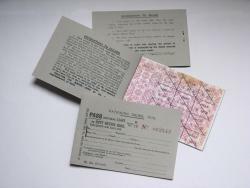 Soldier/Sailor, leave/duty , Ration Booklet. Essential Pass and Ration Booklet, for Soldiers & Sailors when on leave and not being fed from military sources. Includes pages of weekly coupons for meat, tea, butter, sugar, jam, lard, etc.